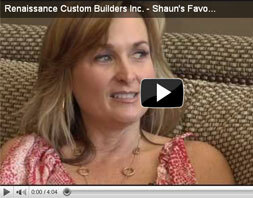 Renaissance Custom Builders is able to manage all aspects of creating your dream. Our range of services includes Design/Build to General Contracting as well as Construction Management. We would be more than happy to discuss all of the options available to you. We build and remodel custom residential homes and commercial properties with the priority being to provide unsurpassed client service and satisfaction. We believe the best way to achieve this is through teamwork and open communication between the client, the architect and designers, the trades people and of course, ourselves. We feel that this is only way to bring to fruition the ideas and concepts of the home owner, the architect and the designers. We are proactive in finding solutions for our clients that best achieve their goals. Lasting relationships are the lifeblood of our business. Personal attention to our clients as individuals…caring about them as individuals is what distinguishes us. Renaissance Custom Builders, Inc. is consistently associated with the high standards of service, quality, personal attention to clients, and integrity. Because of this reputation the company has the privilege of being involved with exceptional projects. Our commitment is to the finest craftsmanship and uncompromising standards while providing only the very best of personal attention to our clients. Building a 'home' should be a rewarding and unforgettable experience for all the 'right' reasons.